1992 On March 2 1992, Kazakhstan became the member of the UN. On March 2 1992, Kazakhstan became the member of the UN. The United Nations — the international organization created by the initiative of the USSR, the USA, China and Great Britain after World War II for maintenance and strengthening of an international peace and safety. The headquarters of the UN is located in New York, the USA. At the moment 193 countries are the members of the UN. The name «United Nations» was offered by the President of USA F. Roosevelt. The declaration was adopted in San Francisco on October 24, 1945. This day is celebrated as Day of the United Nations. Kazakhstan became the member of the UN on March 2, 1992, and on June 15, 1992 the Permanent Mission of the Republic of Kazakhstan at the United Nations was created by the Decree of the President of Kazakhstan. 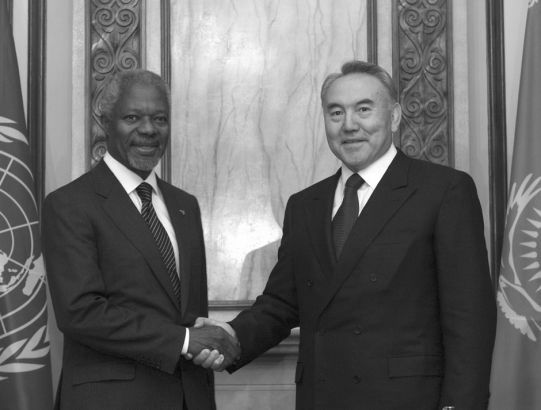 Kazakhstan became the 168th member state of the UN. Main objectives of cooperation of Kazakhstan with the UN are advance of our strategic interests at the international level and attraction of capacity of the UN to the solution of questions of development of Kazakhstan in many directions. In the cooperation with the UN Kazakhstan pays special attention to a number of the priority directions: international nuclear disarmament and non-proliferation of weapons of mass destruction; fight against human trafficking; protection of civilians during the conflicts, especially women and children. Akmaral Haydarovna Arystanbekova was appointed the constant Representative of the Republic of Kazakhstan to the UN from 1992 to 1999. The bright talent of the diplomat, outstanding organizing abilities of A.Arystanbekova were shown at the entry on March 2, 1992 of sovereign Kazakhstan in the United Nations at the 46th session of the United Nations General Assembly. She was responsible of all preparatory process and prepared all documents. At the beginning of 2012 Kazakhstan was elected as member of Bureau of Executive Council of UNICEF for one year. For the first time in the history of the second for the importance in UN system the post of the Deputy secretary-general of the United Nations was held by Kasym-Zhomart Tokayev who is also the CEO of office of the UN in Geneva and the Secretary General of Conference on disarmament. His appointment became the certificate of high professional and political level of the Kazakhstan representative and recognition of authority of our state and the President. Activity of the UN in Kazakhstan is carried out in the form of Country team which includes the Program of Development of the UN (UNDP), Children’s Fund UN (UNICEF), sub-regional office of UN Fund in the field of the population (UNFPA). Also regional representations of UNESCO, Management of the UN High Commissioner for affairs of refugees, the Female UN, the Integrated Program of the UN on HIV/AIDS (UNAIDS), Management of the UN on coordination of humanitarian issues, WHO, Management of the UN on drugs and crime, Volunteers of the UN and International Labour Organization (ILO). The book was the first example of the academic history of Kazakh nation in the Soviet Union. The History of the Kazakh SSR was prepared in the city of Alma-Ata (now Almaty) by the group of the Soviet historians and was published in 1943. As everybody knows, in autumn 1941 a group of prominent historians was evacuated to the city of Almaty. Corresponding Member of the USSR Academy of Sciences A. Pankratova, professors N. Druzhinin, A. Kuchkin, M. Vyatkin were among them. Five of them led by A. Pankratova expressed the wish to prepare a book on the history of Kazakhstan in conjunction with local scientists. It appeared that the book was included in the plans of the republican People’s Commissariat for Education. The result of their work was a book named "The History of the Kazakh SSR". Yermukhan Bekmakhanov was an author of the fourth chapter of the book telling about the national-liberation movement under the leadership of Kenesary Kasymov in the 19th century. This work was greatly valued by historians and even nominated for the Stalin Prize. However, after a while the work was strongly criticized by other Soviet scientists. For example, Corresponding Member of the USSR Academy of Sciences A. Yakovlev wrote a negative review of the book. Disputes concerning this book didn’t diminish over time. In 1948 in Almaty, the Academy of Sciences of the Kazakh SSR hosted 5-day debates. A transcript of the meeting was 552 pages. They are evidence that some scientists, especially those from Kazakhstan, attacked Bekmakhanov with the aim to destroy his works. Bekmakhanov was denounced as a "bourgeois-nationalist" for idealizing Kenesary’s uprising. A denouncing article on his work was published in the Pravda newspaper in 1950. On January 16, 1950 he was excluded from the Communist Party membership and dismissed from the university. One year later he was deprived of all degrees and titles. On September 5, 1952 Bekmakhanov was arrested in Novotroitsk and brought to Alma-Ata. Under article 58-10 of the Criminal Code, Yermukhan Bekmakhanov was sentenced to 25 years of imprisonment in labour training camps. After the trial, he was sent to the city of Bodaybo, Irkutsk region. 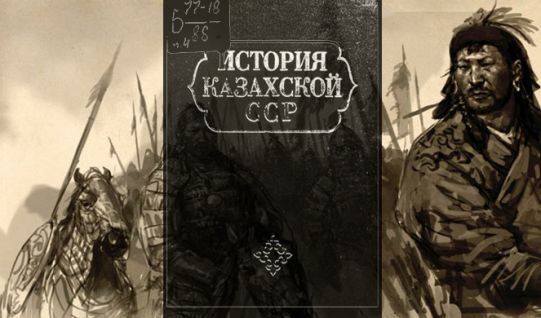 Under the influence of the criticism and debates on the first version of the book, its second edition entitled "The History of the Kazakh SSR" (updated and revised version) was published in 1949 edited by I. Omarov and A. Pankratova.